47 Denison Total Abstinence Club. Denison July 27 1878 Met as per adjournment, A.[C.?] Smith in the chair. Prayer by Rev. JB Hawk Records of former meetings read & approved. Address by Rev. Mr. Ward & by OB Selden. A.C. Smith reported 3 signatures to pledge. Mrs. Matthews reported 13 signatures to pledge. 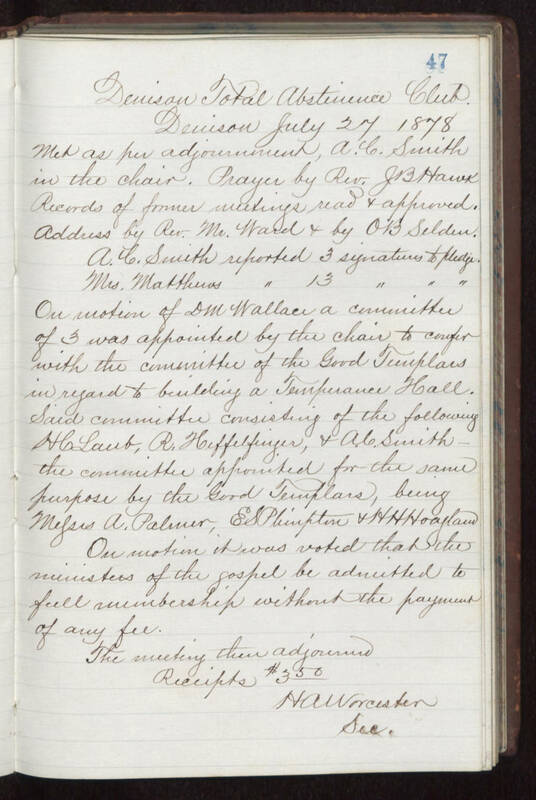 Our motion of DM Wallace a committee of 3 was appointed by the chair to confer with the committee of the Good Templars in regard to building a Temperance Hall. Said committee consisting of the following HC Laub, R. Heffelfinger, & A.C. Smith. the committee appointed for the same purpose by the Good Templars, being [illegible] A. Palmer, ES Plimpton & HH [illegible] On motion it was voted that the ministers of the gospel by admitted to full membership without the payment of any fee. The meeting then adjourned Receipts $3.50 HA Worcester Sec.